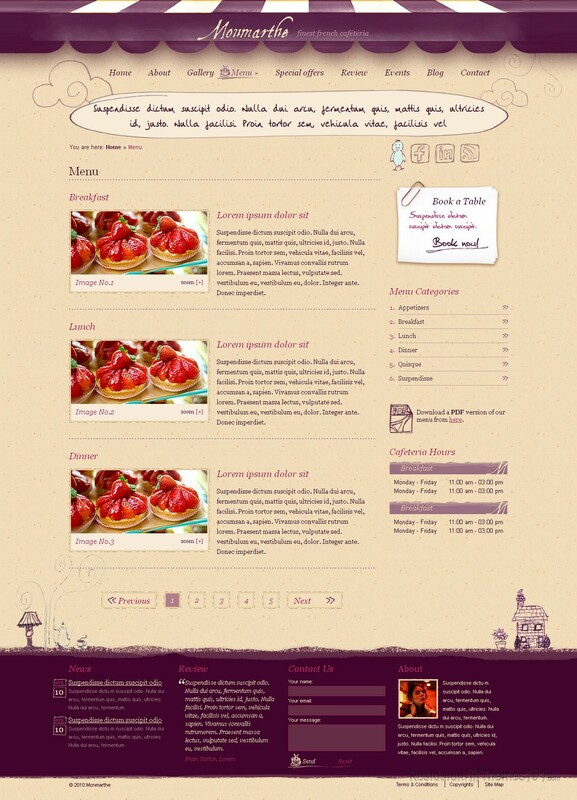 Monmarthe is a HTML restaurant template created by Theme Laboratory, and featured at ThemeForest. 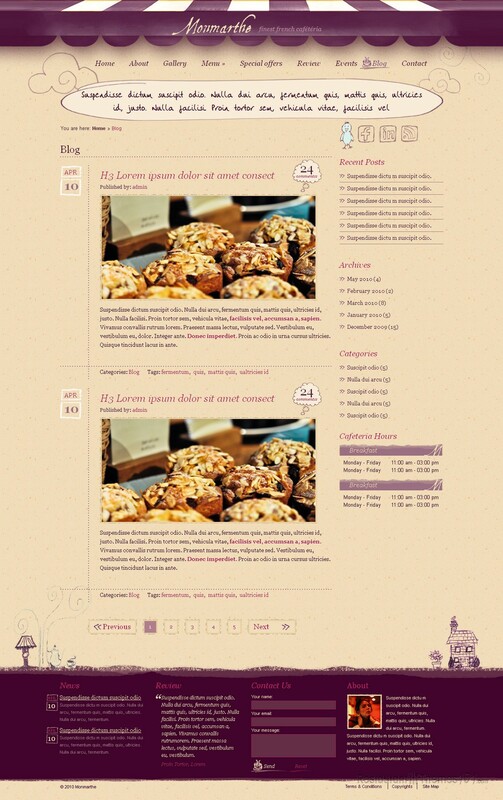 It can be also used as a cafe template HTML, as well for other food related businesses. The layout of this theme looks as cute as possible. The colors prevailing are bright and joyful, with pinkish and violet details, and it features a pretty background with a nice pattern. The homepage features a nice looking slider where you can post photos of your favored delicacies, or your nice looking restaurant. The slider will be the center of your visitor’s attention the minute they open your website, so you can be sure any photo you add to it will be noticed by your visitors. When it comes to features, this template offers many. It includes a very handy reservation form, so your visitors can make their reservations right there on your website by clicking “book a table” and filling in a simple reservation form. Also, you will be able to announce any upcoming events you might be preparing. Monmarthe allows you to post your working hours on your homepage, and you will be able to feature some of your chosen meals as Today’s special, or your latest menu. A very handy contact form is also added to the homepage, so your visitors can send you a message very easily and very quickly. You can also post testimonials and reviews of your happy customers and present them to your homepage. The template features cute icons created by the developer so they are free for commercial use. Social integration was not left behind; you will be able to connect with all the most popular social networks. The menu looks great and it will be very easy for you to create a categorized menu with photos and details included. The contact page features Google Maps so anyone can get exact directions to your restaurant. 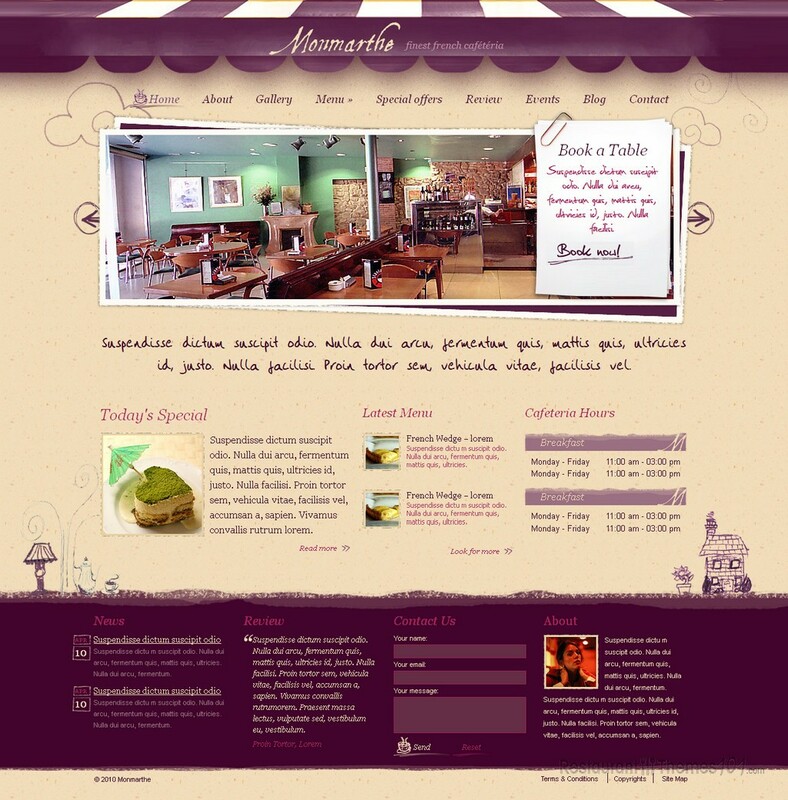 Monmarthe is very well documented and it will be very easy for you to customize this template.